SAVANNAH Georgia (March 22, 2013) – Stories of Savannah in the 1920s are of romantic places and ideals, romantic adventurers and rascals, romantic movies and debonair villains, West Broad Street jazz and blues, and Frogtown’s soulful folk lore of haint blue door posts and the conjures of root doctors. April 6, 2013) Photo: Library of Congress. Romantic Inns of Savannah is pleased to share a few of the dear stories, plus ideas for things to do and spots to visit in Georgia's First City. Savannah’s population was 83,252 in 1920. 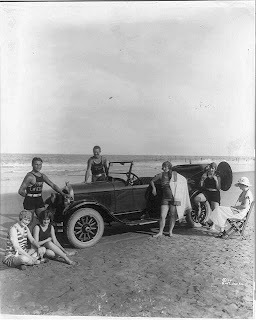 “In the 1920s, the ‘Jazz Age’ business flourished in Savannah, as it did in the rest of the nation,” we read in the City of Savannah tour guide manual. A Society for the Preservation of the Parks was organized in 1921 and continued to battle against the destruction of city squares through World War II. Fort Pulaski National Monument, named after Revolutionary War hero General Casimir Pulaski, was first established in October of 1924 by order of U.S. President Calvin Coolidge. Born in 1925, Southern Gothic writer Flannery O’Connor (1925-1964) became the three-time winner of the O. Henry Award and posthumous winner of the National Book Award for Fiction for The Complete Stories. She was born in St. Joseph’s Hospital, at the time located at Taylor and Habersham streets overlooking Whitfield Square. Her family home still overlooks Lafayette Square. On March 23, 2013 (3 p.m.) at the Flannery O’Connor Childhood Home and on Lafayette Square the Flannery O’Connor Foundation celebrates her birth at the Flannery O'Connor Homemade Parade and Garden Party. Visitors can shop for unique books and gifts and also wander in the garden where a six-year old O’Connor famously taught her chicken to walk backwards. between South Carolina into Georgia to reach Savannah. 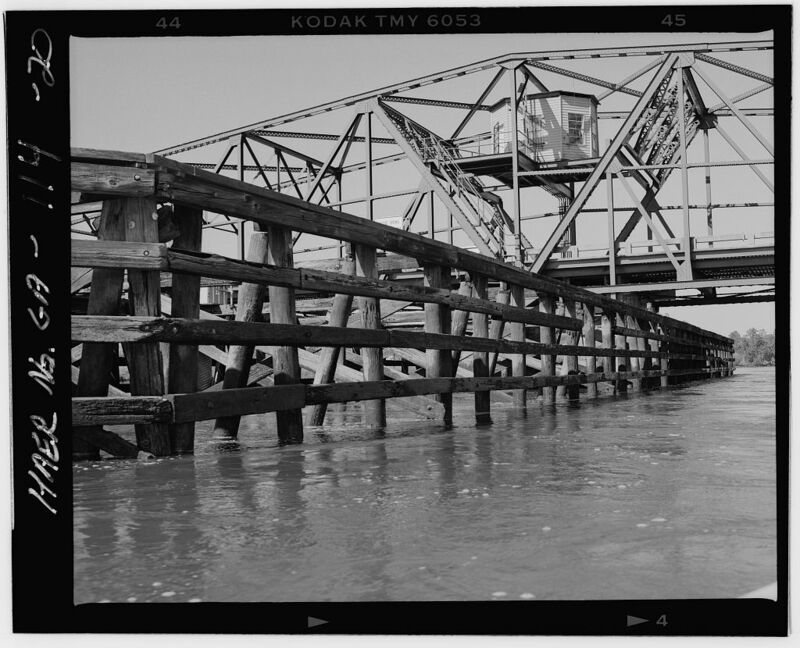 In 1927, the Savannah National Wildlife Refuge was officially established. 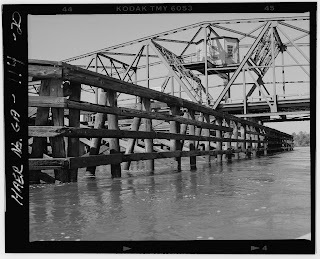 Located along and just across the Savannah River into South Carolina, one would drive across the Houlihan Bridge (photo left, still in operation) to reach the wildlife refuge, a popular spot today for nature photographers. The city’s first radio station, WTOC, began broadcasting in 1929. 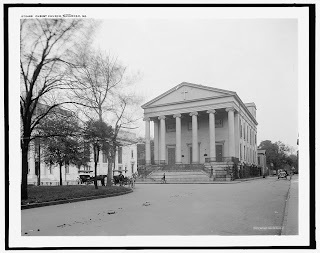 Reading the slang of that romantic era, it is easier to envision the liveliness heard spoken on the radio, in the music, and chatter in Savannah during the 1920s -- “And how!” (I strongly agree) or “Bank’s closed” (no kissing or making out). During the romantic era of the Roaring Twenties, it was in Tin Pan Alley -- the music industry in New York, located between 48th and 52nd street – where Savannah’s own Johnny Mercer set out in 1928 when he was 19 to begin his now famously successful career in music. If you don't know the name think "Moon River,", "Days of Wine and Roses", and "Two of a Kind" -- a Johnny Mercer Bobby Darien recording tapped by Apple for commercials in 2012 comparing the iPad and iPad mini. Moon Travel Guides writes of Johnny, “who began his theater career locally in the Town Theater Group”. Today you’ll find Johnny Mercer’s bronze statue in Ellis Square, a marble bench to honor him in Johnson Square near Christ Church where he was a choir boy, and his family grave in Bonaventure Cemetery. And, you can see, row and fish in “Moon River”, which runs by the family's summer home and ‘huckleberry friend’ coastal playground of little Johnny Mercer. In 2009 for the Johnny Mercer Centennial, Carol Stalvey wrote A Day at Massie School in the 1920’s: Johnny Mercer's Elementary School in Savannah, Georgia. It gives insights into the child’s school life at Massie School. Now open to the public as Massie Heritage Center: Savannah’s Museum for History and Architecture, Massie School on Calhoun Square opened in 1856 as Savannah's first free public school, operating continuously except for its use as a Union hospital during the Civil War. Extensive renovation were completed in 2013. The 1920s was an era of “boot leg” (illegal liquor) available in speakeasies (“juice joints”). It was where one knocked on the door with a secret code to request entrance. Today Mata Hari (Lower Factor's Walk near River Street) is a private club marketed as a speakeasy. 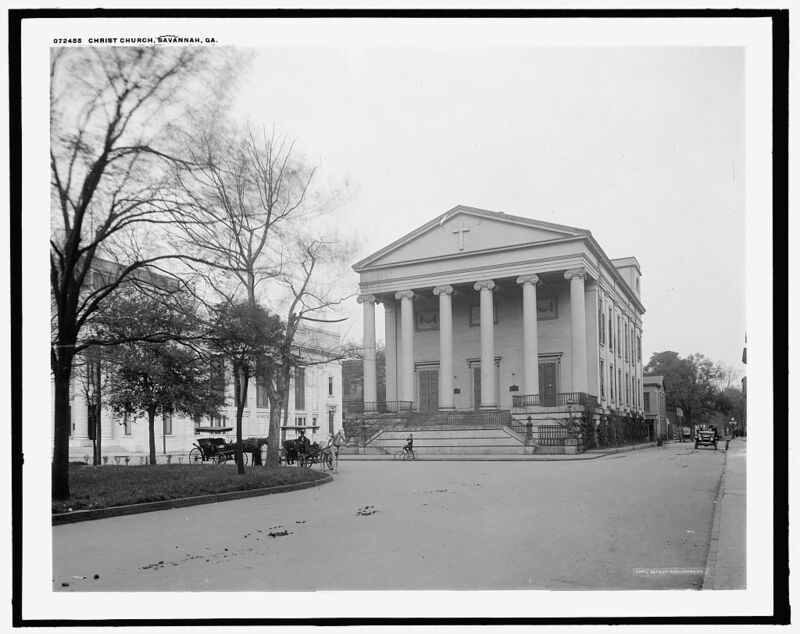 In the State of Georgia archives of “Vanishing Georgia” we discovered a 1920’s photos -- a Savannah policemen and his horse on Oglethorpe Avenue, Kingnut butter display at Chatham County Fair, and Interior of the Citizens and Southern Bank (now Bank of America) located on Johnson Square at Bull and St. Julian Streets. Sixth Sense Savannah haunted tours points to a 1920s photo of the root doctor’s house. Surely there are tales of voodoo and herbal conjures in the folk lore – the tales of Savannah’s Frogtown! A search of “1920s Savannah” in Google gives us a scrapbook of images, each sure to have character-rich southern stories. We even stumbled across 1920s Era Entertainment for hire in Savannah today. Museum in Savannah, Georgia USA. 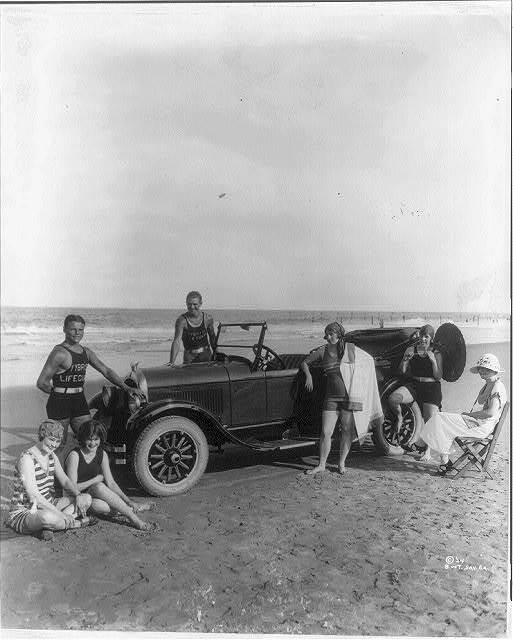 Silent era movies were made in Savannah. The yet-to-be-mega-star and “Latin Lover” of the silent movies, Rudolph Valentino stared in Stolen Moments, principally filmed “at a Savannah mansion on Greenwich Plantation. Reportedly it rivaled Biltmore House in Asheville, NC, in both size and architecture. Source: essanaytrading.com. It was an era when the pipe organ provided the movie score. Movie photos and city-side Savannah location pictures are posted HERE. The US television premiere was on Turner Classic Movies on May 22, 2006. (now Greenwich Cemetery) in Savannah, Georgia USA. The magnificent Greenwich Plantation mansion was destroyed by fire in 1923 just a few years after the Stolen Moments filming. More than a few of the plantation’s statuary now resides as part of the Telfair Museum collection, on indefinite loan from the City of Savannah. Many are on display inside the Telfair Academy of Arts and Science, located on Telfair Square in downtown Savannah, Georgia USA. Needing repair, the elegant white marble fountain remains at the old plantation. 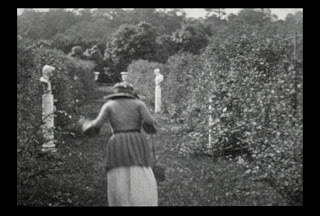 It is seen in background in a scene with actress Marguerite Namara. Rudolph Valentino starred also in the American romantic drama, “Camille” (a silent movie released in 1921), the first movie to be shown in the Lucas Theatre in downtown Savannah. Camille was included in Time Magazine's All-Time 100 Movies in 2005.
designated a National Historic Landmark on June 2, 1978. Today the beautifully restored Lucas Theatre is where, periodically, classic movies replay on the big screen and a continuing series of contemporary events literally light up the night. The vintage marquee announces the 2013 show-stoppers. Also, daily silent movies play on the screen at The Distillery craft brew pub and restaurant, just off Martin Luther King Jr. Blvd. near the Savannah Visitor's Center. What an exciting era! In Savannah, one historical era builds on another. The City and her citizens keep the best and keep expanding upon it. As you can tell the 1920s are very much alive here. 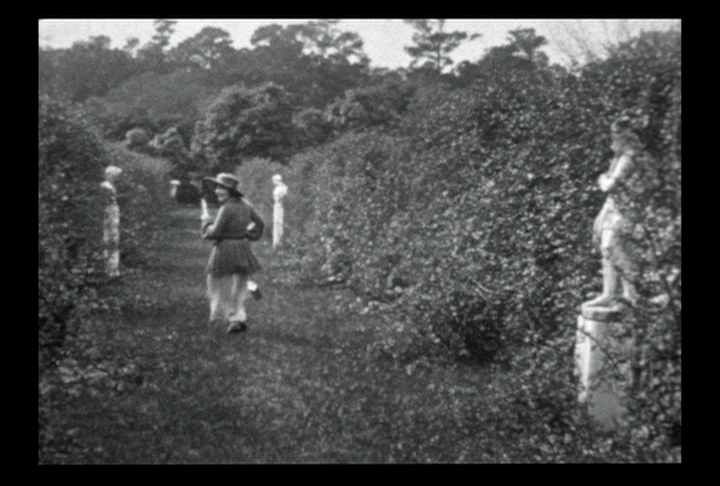 Stay tuned for more romanticizing in our Romantic Inns of Savannah story series -- “Savannah through the Decades”. Copyright (c) 2013 Sandy Traub. SAVANNAH Georgia (Updated April 2015) -- Scottish lineage has seeped and soaked into the Georgia populace the way the Ogeechee River saturates the Low Country swamps and sloughs. Lafayette Square in the National Landmark Historic District. When you visit Savannah watch for Scots – diaspora that is, maybe a few directly from Old Scotland. A kilted Scot here, bagpipes playing there. Scottish families have been in Georgia since the colony’s beginning years and made up a large percentage of the population even at that time. 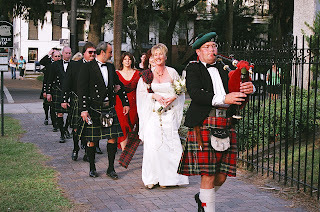 The innkeepers of Romantic Inns of Savannah issue a special invitation to ‘stay romantic’ when arriving for the Savannah Scottish Games (May 2, 2015) and Kirkin of the Tartan (May 3, 2015) at Independent Presbyterian Church. Lodge in one of a dozen of the history-rich charming inns, all located in the National Landmark Historic District. Even the founder of the state, James Edward Oglethorpe has plaited lines of Scottish ancestry. His father, General Sir Theophilus Oglethorpe was English… “to the bone” one might say. But, his mother, Eleanor Wall, was Irish. Her family has been touted by Georgia historians throughout the state’s history as being “related by marriage” to the house of Argyle in Scotland. Eleanor’s maternal grandfather, Lord LaRoche of Tipperary, was more than just associated by marriage. Kirkin of the Tartan at Independent Presbyterian Church. Today by a study on the website Ancestry.com one can connect the family of the titled heirs, Lords LaRoche along a weaving, genealogical line that zigs and zags across the Erin landscape and over the Irish Sea to Scotland. There it winds through Western Scottish Highlands and down through the Ayrshire Lowland’s, through grandfathers and grandmothers of historic mark, members of the clans of Campbell, Kennedy, Carrick and Stewart. It then reveals that Eleanor and her Georgia founding son, James Edward Oglethorpe are direct descendants of Scottish hero-king, Robert the Bruce. Bruce, you may remember, was immortalized by Scottish poet Robert Burns over a century ago. But more recently he was highlighted in Mel Gibson’s movie, Braveheart, when Scottish actor Angus Macfadyen punctuated the warrior-king’s historic call, “You have bled with Wallace! Now bleed with me!” That’s Robert I, the Bruce. He’s purported to have enunciated those words…, or at least something similar. Many of his descendants, Oglethorpe’s distant cousins, can be found living in and around Savannah, Georgia today -- seeped, soaked, saturated. In 1733 the year of Georgia’s founding Oglethorpe created a defensive position a few miles upriver from Savannah. In 1736 Patrick MacKay, John Cuthbert and George Dunbar, all Scottish Highland officers, made their homes in the swath of wilderness that was then called Joseph’s Town. The location became Mulberry Grove Plantation. 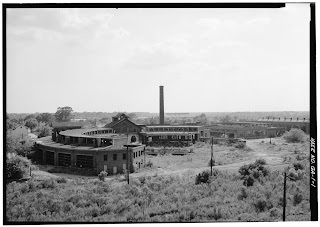 Many years later it was there that Eli Whitney invented the Cotton Gin and changed the face of the South. Those Lowland Scot gentry, wanting an occasion to commemorate and the libation thus associated, created the “Scotch Club.” St.Andrew’s Day, 1735 was their first time to celebrate. It is still celebrated annually. Always with a wee dram. A few miles south, other Highland Scots settled New Inverness, the coastal city that is now called Darien, Georgia. John Mohr McIntosh was their Clan Chief. His family included son, General Lachlan McIntosh, nephew and Cherokee Chief William McIntosh and nephew George Troup who became Governor of the State of Georgia. Oglethorpe accompanied the Scots on their voyage from Inverness, Scotland and upon arriving donned a kilt when he stepped from the boat. Scottish Games at Fort Jackson. ﻿Savannah has its own Scottish Games each May, always on the same weekend as Mother’s Day. Appropriate, one would suppose, since old Scottish lineage was passed equally from either the father or the mother’s ancestry. The games have changed locations over the years but now meet at the historic site of the Bethesda Academy (formerly known as Bethesda Home for Boys) a few miles outside of Savannah. The tree-lined green has ample room for caber tossing and rock chucking. Scottish games were once a test for personal fitness and endurance, “for king and chief, for skill and strength,” it was said. As did the Greeks in ancient times, the clans of Scotland gathered the best and strongest through competition. The winning honor was to be selected as warrior protector of their region – so states tradition. Today, in Savannah and across North America, games are for fun, friends and family. On Games Day everyone is Scottish. If you’re in town, stop in and watch the big guys toss telephone poles. Bring your mom. She may want to chuck the Clachneart [“Stone of Strength”]. Romantic Inns of Savannah wish to thank our guest blogger James Byous. A Savannah, Georgia resident, Jim holds a BA in Journalism and an MA in History. He is a photographer and writer who resides on the Internet at AATRPublishing.com and at JByousPhoto.com. Specializing in the history of his home city, he is currently working on a series of GPS history tours to bring Savannah history to life by taking history lovers to the exact Google Earth locations where history was made.